Is it weird to spend a three-day weekend rearranging bones? Please don't answer that. and painstakingly installed it with bits of baling wire. 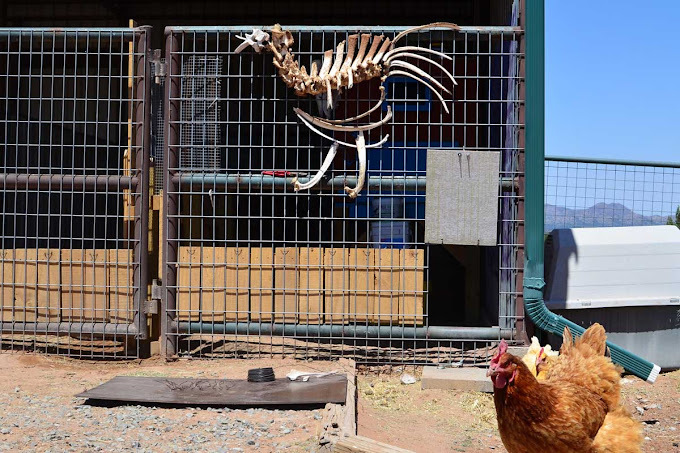 I told Minnie that she might be the first chicken ever to have her own sculpture garden, but she has no appreciation for fine art. Perhaps she was fearful that our next piece would be made from chicken bones. Anyway, the picture above was the inspiration for the weekend art project. until I learned it was made from human bones, then I was totally creeped out. 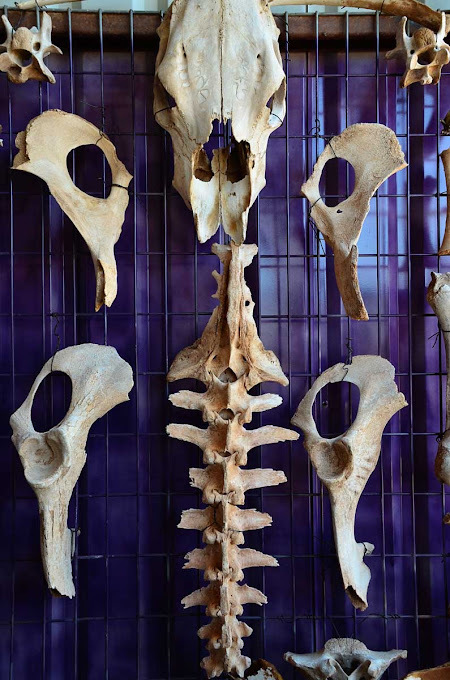 Nonetheless, I thought I might try something similar with my cow bone collection. The chicken coop wall was the canvas for our second sculpture. 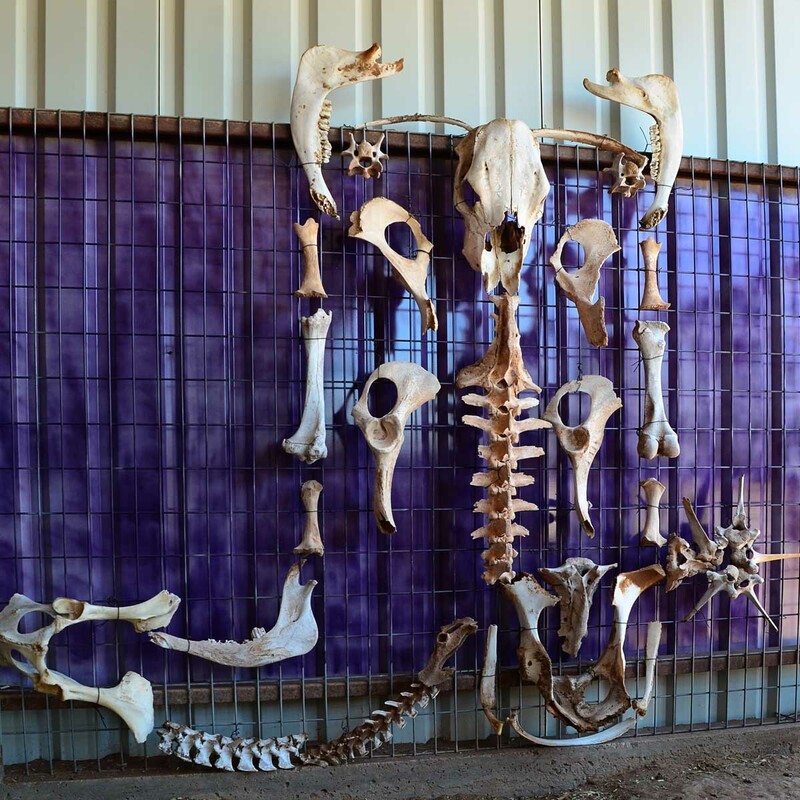 I spray-painted it purple to provide a strong contrast with the sun-bleached bones. This is one small section in the bottom right of the installation. It's one of my favorite parts. Don't worry. Clara and Peach can't figure it out either. This is a portion from the middle of the piece. We were going for a balanced, symmetrical look. Maybe this will help give you the idea. Art...it's in the eye of the beholder. Or in this case, the orbital socket. 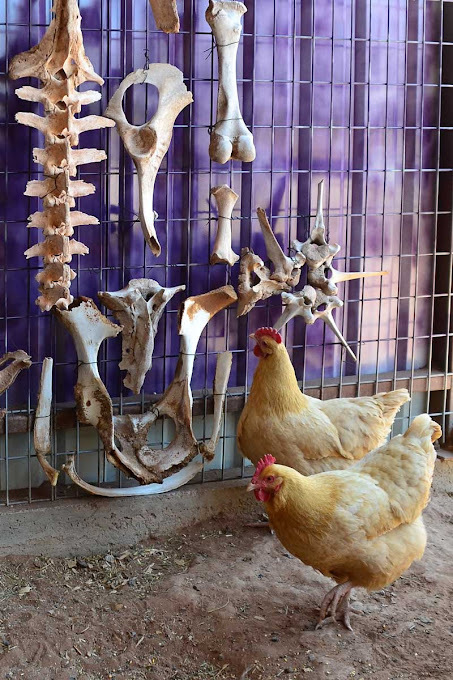 Love the chicken made of bones. The rest of it . . . is . . . quite creative, if a little Texas Chainsaw Massacre-ish. what a great way to spend a holiday. What part of the cow is the spur? Or in the eye of the beerholder! Very, very COOL stuff! A little creepy, but still COOL! Carson, I am totally blown away. The artwork is awesome. Bone art is a new one for me… I just want to know one thing…. What were you guys drinking??? I Like It..... I Really Like It!!!!! 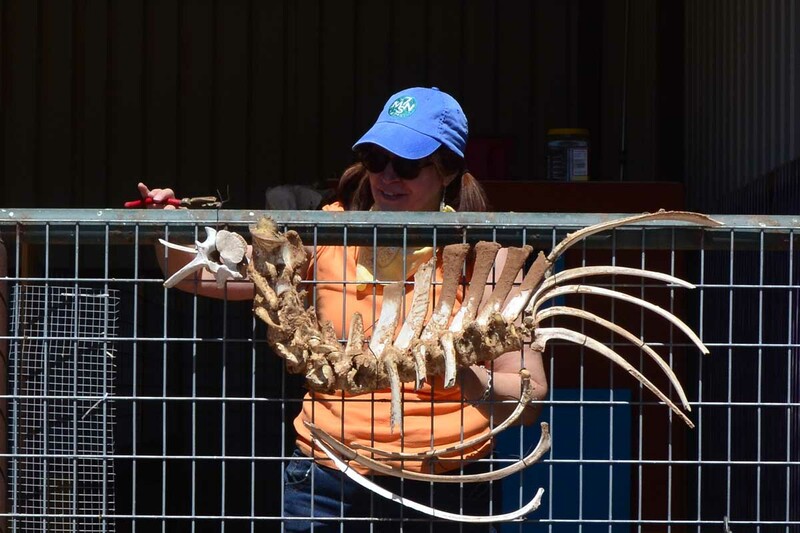 Shelley, the spur is made from thoracic vertebrae. And believe it or not, no adult beverages were consumed during the creation of this art. Afterwards, maybe. Very clever ladies. You done good. It took a whole lot of thought to lay this all out and come up with something artsy looking. Kudos to you and your house guest! Love the chicken sculpture, very artsy. The abstract is interesting too, I can just see the animals wandering around trying to figure out what their crazy person is up to now. Glad you guys had a creative fun weekend. That is amazing! Very creative! Love the chicken and the boot! So stinkin' original!! WOW. Truly impressive. I love the way you hung the chicken so you get such a perfect shadow. The sculptures really seem to bring to life so many aspects of desert living. The good, the bad, the harsh and the beautiful. I am totally blown away. This is fabulous. I am an upcycle, recycle, redux artist but this, this is fandamtastic. Kudos, applause, and wooooo hooooot. Dang girls you dun good. 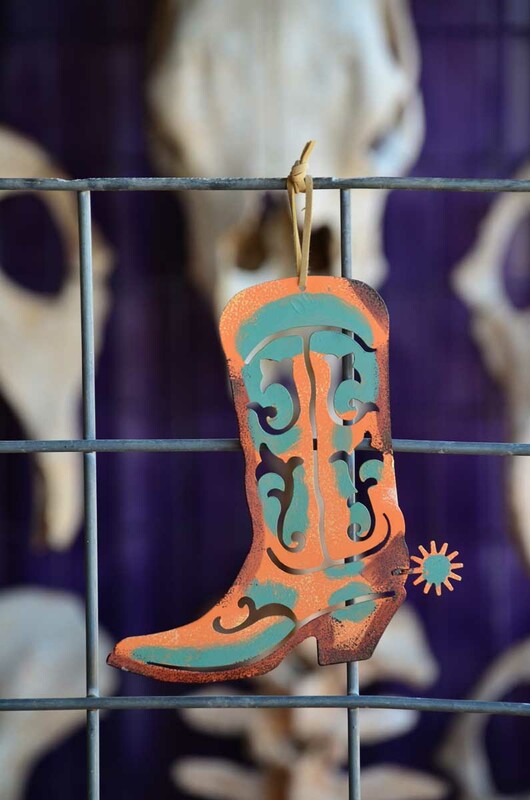 I loved the chicken sculpture, but the cowboy (cowgirl) boot blows me away. Absolutely stellar piece of art! Well done, you guys!! And, I'm completely in favour of the purple background. BTW, that Francois Robert piece is powerful stuff. Very creative and pretty dang cool! I'm with everyone else. Really cool stuff. Very artistic and WAY cool, even though they ARE bones! Great talisman. Those middle of the road cows better watch out. Very creative and looks like lots of fun. That is just incredibly cool! Might have to try something like that some day! That is totally cool! Even if creepy! You might have a second calling! 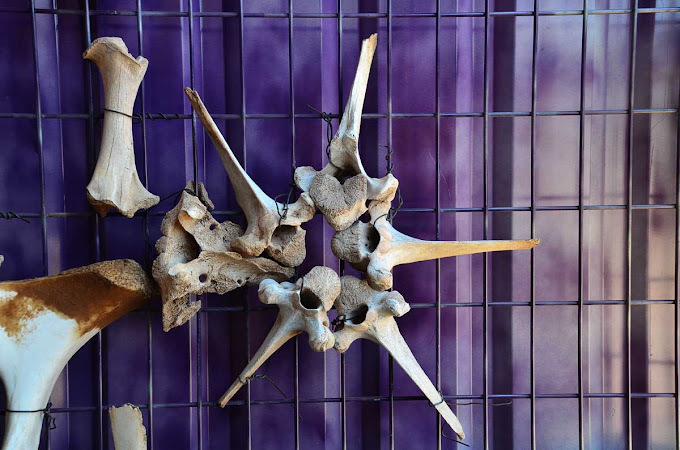 Im sure there are some people who would pay you big bucks to build art with bones on their LA garden walls. And youre upcycleing too! I'm late to this party but have to agree with everyone, WOW, just WOW! clap, clap, clap! Very cool art. That boot is freaking fantastic! Please show Lucy what you've done with most of dem bones she's carted around for you from hither and yon!! At least she'll see a method in your madness...'bone art' for items she has thought should be left for the coyotes and not slung across her own withers!! She's been so patient. To me these pieces are awesome, quirky, macabre, funny, and a fabulous way to laugh with your dear friend's twisted mind!! I agree with an earlier post that these could fetch some real cash, a supplement for your future retirement income?! Oh, no way! This turned out absolutely AMAZING!! You two are incredibly clever. The spur on the boot is unbelievable. Love the purple backdrop. And, ok, am I the only one who thinks this needs to be featured in a magazine on New Mexico life? 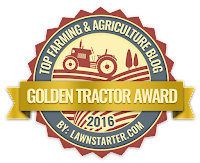 I had the best time looking at this blog post! How funny! I think the sculptures are really unique and interesting! 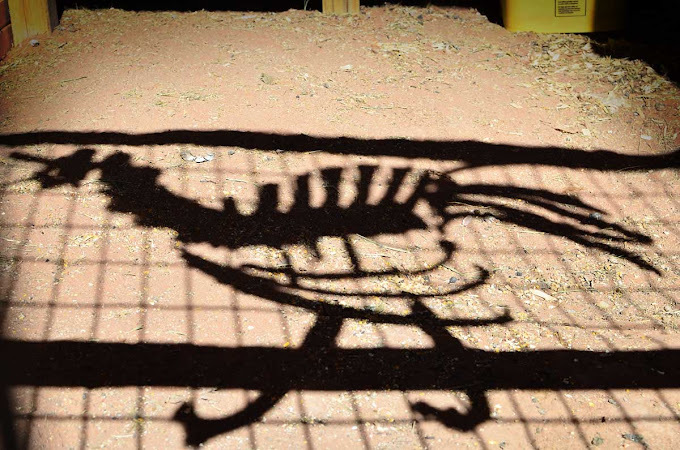 The photo of the chicken sculpture's shadow was really neat! 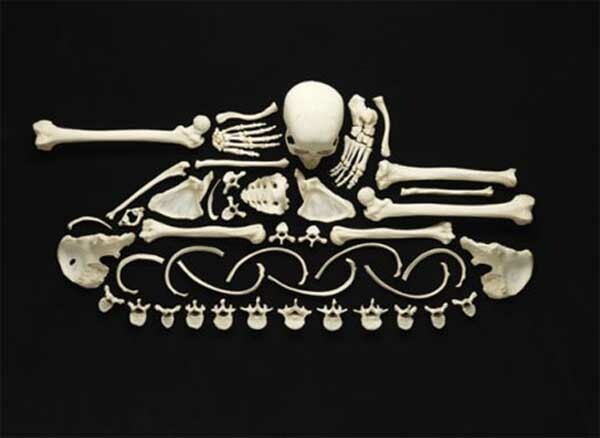 I think the original tank sculpture was an anti-war statement, being made of real human bones, and all. So, it was depressing. But yours were fun! Loved them! Now all sing along: "The hipbone's connected to the ... (eehh, what?!)" Come on Lucy, put your saddle on and collect some more bones!